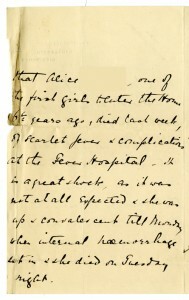 One of the diseases we find mentioned in early children’s case files is scarlet fever. In some cases children who contracted the disease recovered and went on to find employment or to return to their families. Sadly, some were not so fortunate. Alice was five years old in 1890 when her mother died of tuberculosis. Three years later, Alice’s father was admitted into Birmingham Infirmary with the same disease, being described as “in the last stage of consumption” (an old term for tuberculosis). One of Alice’s brothers was admitted into Birmingham Infirmary at the same time suffering from a brain tumour. With no-one else to look after them, Alice and her remaining brother were sent to Birmingham Workhouse. It was then that an application was made for Alice to enter the care of The Children’s Society (then known as the Waifs and Strays Society). At seven years of age, in 1893, Alice entered The Society’s new home for girls in Handsworth, Birmingham, known as the Calthorpe Home. Medical certificates were completed for all children who entered The Society’s care. Alice was seen by the medical officer at Birmingham Infirmary before entering the Calthorpe Home and was described as having good general health. It appeared that Alice had escaped the tuberculosis that had afflicted her parents. Unfortunately, there were many other diseases that could prove fatal to children in the late Victorian era. One of the questions that the medical certificates asked was if the children had previously had certain diseases, such as whooping cough, measles, small pox or scarlet fever. Alice’s certificate states that she had had whooping cough but none of the other diseases, meaning that she could be susceptible to them not having been vaccinated against them. The next we hear of Alice is in 1900, when she would have been fourteen years old. The letter from Handsworth is below. 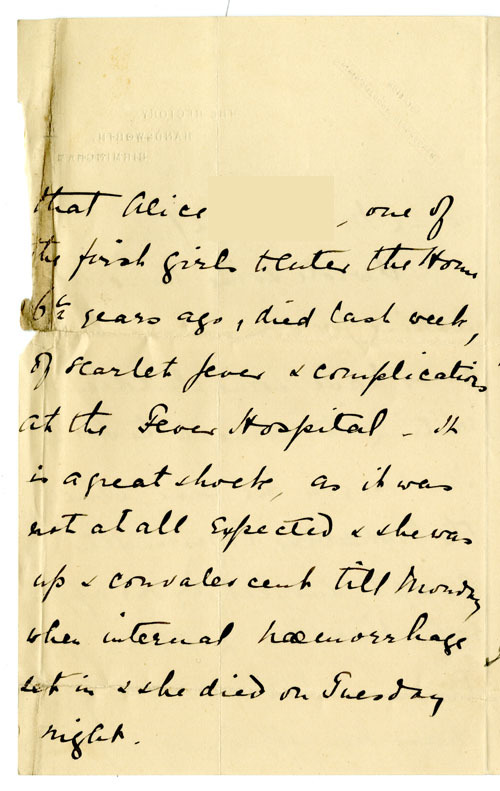 There is no further correspondence about Alice’s illness in her file so it is not possible to know how long she had suffered from the disease or when she had gone to the Fever Hospital. What is clear is that her death from the disease was sudden and unexpected. The fact that The Society’s medical certificates asked if the children had ever had scarlet fever shows that the disease was a common and a contagious one. Perhaps other children at the Calthorpe Home fell ill at the same time, although we won’t know without further research. It would appear, then, that Alice’s brief life was beset by illness; both hers and her family’s. We can only hope that her years in the Calthorpe Home before she fell ill had been happy ones. What medicines do you remember? In previous posts, I’ve mentioned treatments and medicines that aren’t so commonly used any more although they were very popular in their time. If you can remember any of these, or would like to tell us about any other common medicines or treatments that you can remember, please let us know in the comments section below. In the post about influenzal colds in 1940, the medical book notes that the children were treated with 693 tablets. 693 was a name for an antibiotic medicine called sulphapyridine. It was produced by the firm May and Baker and so was often also known as M&B. The drug was first discovered in 1937. In tests it was found to be an effective treatment for pneumonia and it was also used to treat other infections such as sore throats and gonorrhoea. In fact, it became so popular that it was widely used during the Second World War and May and Baker had trouble keeping up with wartime demand for the drug. Famously, Winston Churchill was successfully treated with M&B when he was suffering from pneumonia in 1943 which he contracted shortly after attending the Teheran conference that finalised the strategy for the war against Nazi Germany. 693 was later superseded by penicillin and other antibiotics. In the post about tuberculosis in the early 1900s, we find that when John was ill, but before the cause of his illness was known, he was treated with cod liver oil. Cod liver oil contains vitamin A and vitamin D and it is still used today as a supplement to help with joint problems. In the past it was regularly given to children; this was to help prevent rickets, which was very common in the early-20th Century. Presumably, as in the case of John, it was also seen as a cure-all that could help to relieve someone’s symptoms when they were ill.
Another treatment mentioned in the post about tuberculosis in the early 1900s is the use of port wine and brandy. When John entered a convalescent home with tuberculosis, he was prescribed port wine, brandy and a generous diet to help build up his strength. Alcohol has been used as a medical treatment for a long time and spirits such as brandy were popular in the late-19th and early-20th Centuries. They were often used as cardiac stimulants that were thought to increase blood pressure, but some doctors used them as treatments for a whole variety of diseases. One of the uses of brandy and other spirits was as a supposed aid to digestion and metabolism. They were often prescribed in the diets of people convalescing from illnesses and it is probably for this reason that they were prescribed for John. In a number of cases we see that children convalescing from illnesses were sent out to homes in the countryside or on the coast. Several of The Children’s Society’s children’s homes were built on the coast for this reason, such as St David’s Convalescent Home in Broadstairs, Kent and St Agnes’ Convalescent Home at Pevensey Bay, Sussex. Leaving the big cities was thought to aid recovery although, interestingly, a number of children’s homes in London took in children with illnesses too. This was because a stay in London meant that the child would be able to attend hospital for treatment. Often they would be sent to London for a brief period of time and then go out to the countryside once the hospital treatment was complete. Do you remember any of the treatments I’ve mentioned here? Please tell me in the comments. It would be interesting to find out how popular they really were. And that’s not all. I’d love to hear about other treatments and medicines that you remember. I’m sure my list is just the tip of the iceberg! I have good news to bring you today. Our Unexplored Riches in Medical History project has received a second grant of £102,309 from the Wellcome Trust’s Research Resources scheme. 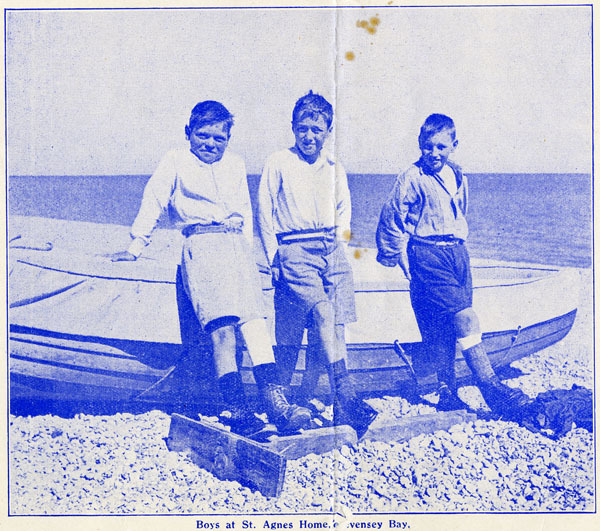 The project, now in its second year, has been making great advances in cataloguing and conserving the records of the residential homes that The Children’s Society ran for almost 100 years up until the 1970s and the case files of the children who stayed in them. In particular we’re focusing on the wealth of information about child health and the effects of poverty contained in these records. This will help to shed light on the history of childhood diseases, treatments, medical care and social health in the 19th and 20th centuries. In the first part of the project, we’ve found that before the establishment of the NHS, many families had to seek help from charities such as The Children’s Society as they couldn’t give their children vital medical treatment, and some families were pushed into poverty directly because of medical costs. Historically, The Children’s Society helped to provide medical treatment for these families, and the records shed light on the experiences of children with diseases such as tuberculosis, rickets, pneumonia and heart conditions among others. By creating an online archive catalogue and through conservation work the records will be widely accessible to medical, social and academic researchers the post-care community and the general public among others. Thanks to the recent grant from the Wellcome Trust, which takes the current total funding from the Trust to £211,124, we can build on what has already been completed. Through the project, we will be able to open up access to The Children’s Society’s valuable records and promote important research into medical history, social history, and the history of childhood poverty and neglect. UPDATE: This information has now been posted on the Wellcome Trust’s website. 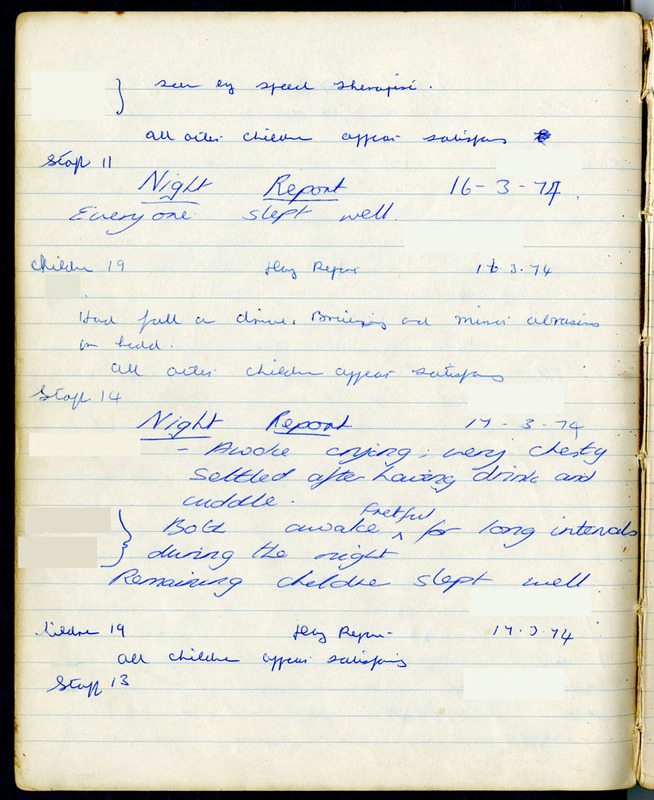 Some of The Children’s Society’s children’s homes in the late-20th Century, particularly nurseries looking after young children, kept daily and nightly log books. These books were kept to monitor the health of the children in the home. 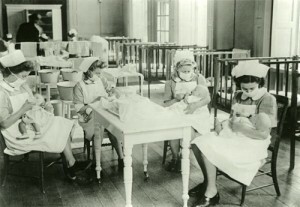 Generally, entries were made each day and each night by one of the members of staff on duty. Because the entries are so regular, they provide very detailed information about the health of the children and can be used to follow the effectiveness of any treatments given for injuries or illnesses. 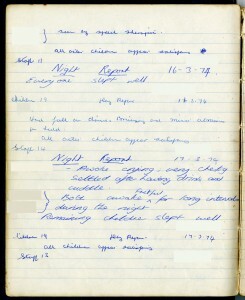 The following image comes from the day and night log book for Sunnyside Nursery for Disabled Children, Box, Wiltshire. Sunnyside Nursery first opened in 1930 as the Holy Innocents Home, with residents transferred to the new home from the recently closed Admiral and Mrs Arden Close Memorial Home for Girls, Bristol. The home started taking on younger children in the 1930s and was known as Sunnyside Nursery from 1949 onwards. It was in 1971 that Sunnyside Nursery started looking after disabled children; this was partly due to its location, as there were specialist hospitals and clinics in the local area. Initially, Sunnyside still functioned as a nursery, but in the late-1970s and the 1980s, Sunnyside started helping older children and young people with disabilities too. An older medical book from Sunnyside Nursery, Box, was discussed in an earlier post about treatments for winter colds in the 1940s. It would be interesting to compare the 1940s medical book with the 1970s day and night log book: Had instances of and treatments of diseases changed in the intervening decades? And did the medical provision for Sunnyside change when it started looking after disabled children?